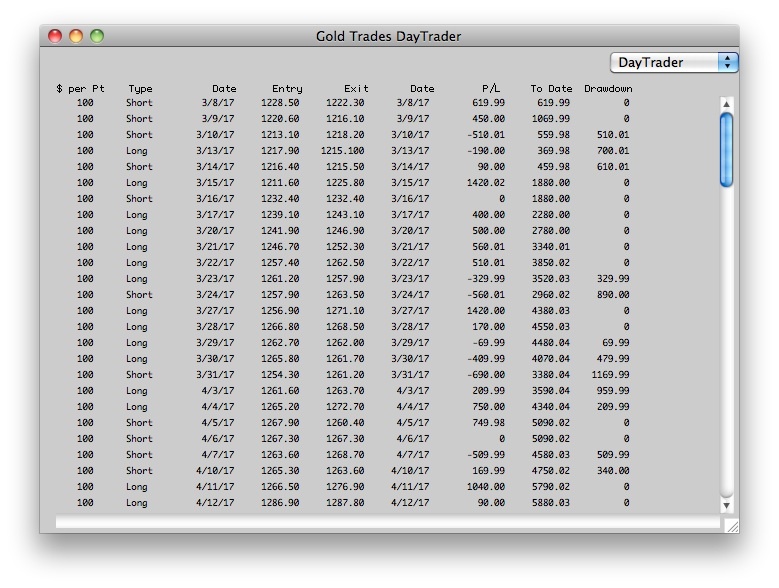 The DayTrader, a feature of both Personal Hotline and HotlineX, is based on a pivot point system used by many commodity floor traders. While the DayTrader was designed for the futures' markets, today many stocks are high volatility and trade like commodities. The system projects support and resistance levels based on today's range and where we closed within that range. The recommendations are presented in the Master Analysis report. A separate report containing DayTrader results and recommendations only is also available. HotlineX issues live audio/visual alerts based on the DayTrader. Theoretical performance results have many inherent limitations. Some examples... Theoretical trading does not involve financial risk and no theoretical trading record can completely account for the impact of financial risk in actual trading. The ability to withstand losses or to adhere to a trading program while sustaining losses can also adversely affect actual trading results. These and numerous other factors, may produce sharp differences between thoretical performance and actual trading results achieved by any trading program. No representation is being made that any account will, or is likely to achieve, profits or losses similar to those shown.